Rick Lubinski is president of Think Energy Management LLC, a nationally recognized energy consulting firm. Rick speaks to organizations about how Energy management can lower operating expenses, reduce budget risks, improve building quality, improve employee productivity, enhance net operating income and contribute to asset appreciation. Tom Mugridge is a Certified Arborist in the State of Ohio, and a Registered Consulting Arborist. His professional memberships include the International Society of Arboriculture (ISA), the Tree Care Industry and the American Society of Consulting Arborists (ASCA). Proper care of trees and shrubs. 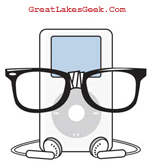 If you are an expert in a topic and interested in making presentations, let us know if you want to be considered for inclusion in the Great Lakes Geek Cleveland Speakers Bureau.